Our Vetnostics team are dedicated to ensuring you and your clients receive a first class diagnostic service. Our Veterinary Pathologists are available to answer any questions or discuss results phone 1300 VET QML (1300 838 765) or email us. BVSc (Hons), B.BiomedSc (Hons), M.Phil, MANZCVS, Diplomate ACVP (Clinical Pathology). 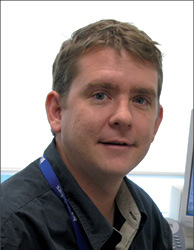 Prior to commencing BVSc studies, Brett completed a Bachelor of Biomedical Sciences with Class 1 Honours at James Cook University, North Queensland. His honours research was in the field of Microbiology and Immunology and focused on the detection of Helicobacter pylori in domestic cats. Brett graduated as a veterinarian from the University of QLD with Class I Honours in 2001 and worked in mixed animal practice on the outskirts of Brisbane for two years before returning to the University of QLD to undertake an internship/residency funded by QML Pathology Vetnostics in veterinary pathology. As a pathology intern Brett also concurrently undertook a research master's project investigating the colonisation and excretion of E.coli serotype 0157 in adult cattle. In 2006, after completing the internship, Brett lectured in clinical pathology at the University of QLD, was a contracted pathologist at QML Pathology Vetnostics and attained membership qualifications with the Australian College of Veterinary Scientists in Veterinary Pathology. In 2007-2008, Brett worked as a diagnostic pathologist at Cytopath Ltd in the UK, then returning to QML Pathology Vetnostics in 2008. After a brief hiatus, Brett accepted the role of supervising pathologist at Vetnostics in 2014. Brett has extensive experience in cytology and histopathology with special interest in immunohistochemistry and immunocytochemistry. In 2015, Brett successfully passed the American College of Veterinary Pathologist examinations and is a diplomat of the American College of Veterinary Pathologists in Clinical Pathology. After graduating Veterinary Science at the University of Queensland, Susan spent several years in small animal practice in Australia and the UK, during which time she achieved Membership of the Australian and New Zealand College of Veterinary Scientist s in Small Animal Medicine and completed the Royal College of Veterinary Surgeons Certificate of Small Animal Medicine. In 2002, Susan commenced a residency in clinical pathology at The Royal Veterinary College, UK, which was followed by a temporary lectureship there. She is a diplomat of the American College of Veterinary Pathologists in Clinical Pathology and a registered specialist. With over 14 years experience in diagnostic clinical pathology, Susan enjoys all facets of clinical pathology, with a particular interest in haematology, including haematology of exotic species, and cytology including bone marrow disease. John graduated from the University of Queensland in 1979 and worked in mixed practice for three years, followed by a PhD in immunology at the Australian National University, Canberra. He has over 25 years' experience as a veterinary pathologist, with the Victorian Department of Primary Industries, on faculty at Texas A&M University and (since 1995) in various private veterinary pathology laboratories. John is a Fellow of the Australian College of Veterinary Scientists, a Diplomat of the American College of Veterinary Pathologists, and has adjunct professorial appointments at the University of Queensland and Texas A&M University. His special interests include liver, gastrointestinal and skin pathology, infectious diseases and toxicology. Louise grew up in Brisbane and received her Bachelor of Veterinary Science degree from the University of Sydney in 2006, following completion of a BSc (Vet) thesis in 2004 on the use of immunohistochemistry in the diagnosis of poorly differentiated tumours of the skin and oral cavity in dogs. Louise then worked in a small animal general and emergency practice in Perth, before completing residency-training programs in anatomic pathology at Murdoch University and the University of Pennsylvania. This training culminated in 2014, when Louise successfully passed the American College of Veterinary Pathologists Certifying Examination in Anatomic Pathology. She is also a member of the Australian and New Zealand College of Veterinary Scientists in Veterinary Pathology, and in 2016 was awarded a Master of Veterinary Pathology from Murdoch University, for a study investigating background lung lesions in a colony of specific pathogen free rats. After completing her training, Louise stayed on as a lecturer at the University of Pennsylvania, spending the majority of her time on the department’s busy surgical pathology service, before returning to Australia in 2015. Although Louise enjoys teaching, her major interest is diagnostic pathology and since late 2015 she has worked for private veterinary diagnostic laboratories, first in Adelaide and more recently in Brisbane, following a welcome return to her home state. Her special interests include gastrointestinal and hepatobiliary disease, oncologic pathology, and immunohistochemistry. After graduating from The University of Melbourne in 1988, Sue worked in private mixed practice for seven years before working as a resident, then senior registrar at The University of Sydney from 1995 to 1999. She completed a Masters in Veterinary Clinical Studies on the effects of phenobarbitone on adrenal function tests and serum biochemistry in dogs. In 2000, Sue became a Fellow of the Australian College of Veterinary Scientists in Feline Medicine and took up a position as Lecturer in Small Animal Medicine at Murdoch University. Leaving Murdoch at the end of 2003, Sue then Iectured at The University of Sydney as a visiting scholar in 2004 before joining Vetnostics in 2004. Sue is currently an Adjunct Senior Lecturer in Small Animal Medicine at Murdoch University and a medicaI consultant far Vetnostics. She also works as a locum for both private and university practices. Sue is a registered specialist in feline medicine (WA) but she lectures in both canine and feline medicine and sees cases of both feline and canine internal medicine in practice.